Lagos cuff bracelet in sterling silver. Hinged back for slip-on style. 18k Cablespira Hoop Earrings, 1"
Brutalist soft square hinge bracelet by Alexis Bittar. Ruthenium-tone and 10-karat gold plated brass. 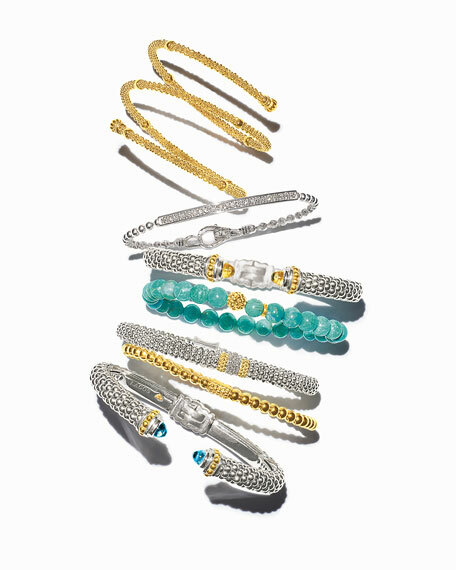 Two-tone accents with Swarovski® crystals. Hand-sculpted, hand-painted Lucite®. Hinged opening eases dress. Approx. 0.9"H; 3.2"W. Slip-on style. Made in USA. Brutalist studded hinge bracelet by Alexis Bittar. Ruthenium-tone and 10-karat gold plated brass. Textured end caps with Swarovski® crystals. Overlapping two-tone rectangular accents. Hand-sculpted, hand-painted Lucite®. Hinged opening eases dress. Approx. 0.5"H; 3"W. Slip-on style. Made in USA. Crystal encrusted capped hinge bracelet by Alexis Bittar. Polished rose golden plated brass hardware and settings. Signature hand-sculpted, hand-painted Lucite® band. Swarovski® crystal pave end caps. Hinged opening eases dress. Approx. 2.4" diameter. Magnetic closure. Made in USA. Crystal double-stone hinge bracelet by Alexis Bittar. Gunmetal and yellow golden-plated brass hardware. Brazilian amethyst crystal and labradorite doublets. Clear crystal encrusted frame with triangular ends. Hinged opening eases dress. Approx. 1"H; 2.6"W.